Getting around Lakeside and Guadalajara (and even the rest of Mexico) without a vehicle of your own is much easier here than NOB (north of the Border). Some of us don’t drive anymore for various reasons, and some don’t want to hassle with bringing a vehicle back and forth if you’re dividing your time between living on each side of the Border. Thankfully, there are plenty of options for getting around without needing to drive your own vehicle here. For economical transportation in the Lakeside area or beyond, there are abundant buses available. 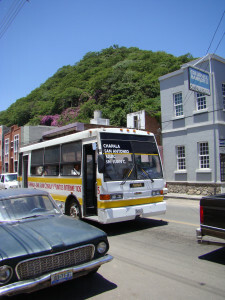 Chapala Bus Lines, with their main bus station located in downtown Chapala, have routes connecting all Lakeside towns, villages, and communities with each other and with Guadalajara. Their buses run 365 days a year, and generally run every 20 to 30 minutes in the daytime (from around 7-8 am until 8:30-9 pm and sometimes later). They are surprisingly punctual, rarely varying more than a few minutes from their scheduled time. Some of the outlying smaller areas may only have bus service arriving and leaving once an hour. If your Spanish is good enough, or if you have a Spanish-speaker to help you, you can call the station in Chapala at 376-765-2212 for specific information. Or you can ask around. Most of the buses will charge the equivalent of a US dollar or less to go from one town to the next. Fares to Guadalajara run around $2 USD. It’s best to have small bills and/or change in Mexican pesos ready. Changing large bills is time-consuming and holds everyone up (driver and other passengers boarding). If you are 60 or over, you can obtain an INAPAM card from the nearest DIF office, which identifies you as “gente grande” (a senior citizen) and entitles you to a 50% discount on all bus fares, local and long-distance, among other discount benefits. Just show the card when purchasing your ticket. Local buses making frequent stops are also available in and around Chapala, Ajijic, San Juan Cosala, Jocotepec, and running between them and all communities between them. Most charge the equivalent of $.50 USD or less. If you’re not sure where to get off, tell your driver the location you’re looking for (for example, Telecable, Wal-Mart, entrada a [entrance to] La Floresta or San Antonio, etc.). Say it as a question, asking the driver to tell you where to debark. He will nod, and motion to you when it’s time to get off, so try to sit close to the front so you can see him. Drivers are surprisingly patient, and good at helping us find our way around. Buses covering most of the Lakeside routes are larger, and may be fairly new, modern and comfortable, or old and bouncy. Local buses are smaller, older, and may be Chapala Bus Lines or an independent line. Some of the area factories run buses to pick up their employees, as well, so be sure to ask someone about which buses are for public transportation. 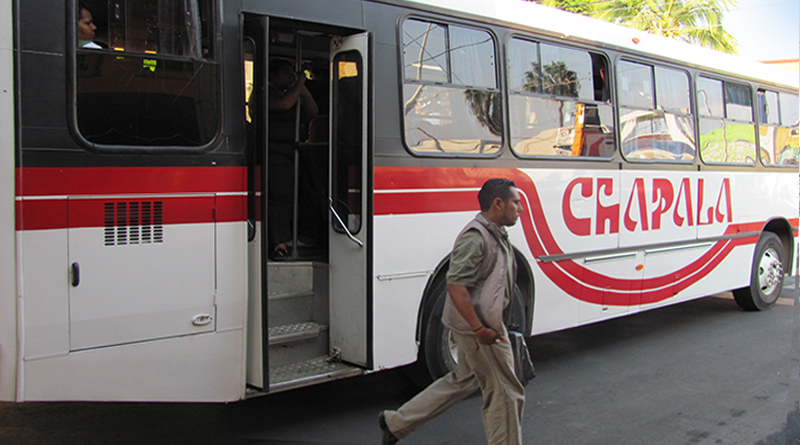 They might be any color, not just the white and red of Chapala Bus Lines. For example, Jocotepec has blue local buses. Buses to and from Guadalajara are newer and nicer and larger, and are available in 2 types: directos (expresses) which go directly from the Chapala bus station or central Jocotepec to the Central Vieja (old bus station) in downtown Guadalajara and back, and segundos (second-class), which make stops along the way. From the Central Vieja in Guadalajara, innumerable buses are available for just about every location in Guadalajara (if you are TRULY adventurous! ), but it’s much simpler and not very expensive to get a taxi for your desired location, as there are always plenty right outside the station. The Central Nueva (new bus station) in Guadalajara, actually located in Tonala, is where cross-country buses are available for every part of Mexico, and for most major cities in the US, as well. Those are also available in directos, which are fast, comfortable, and often as luxurious as riding first-class in an airplane; and in segundos, which are only slightly cheaper, but make many frequent stops and often take two to three times as long. Directos all have clean bathrooms on board; most segundos don’t have a bathroom, and are also usually older buses. Buses are also available to towns on the other (south) side of Lake Chapala, as are trip buses for day trips and multi-day trips to and from specific locations and events. These trips are usually advertised in publications and web sites dedicated to Lakeside events and services. Riding a bus around the Lake Chapala Lakeside area is indeed an adventure, and may be very different from riding a bus NOB. Musicians or singers may stroll down the aisle, entertaining the riders, sometimes with more enthusiasm than talent, and asking for “cooperacion” (donations) of a few pesos in return. Usually they are disabled, or have a health condition making it difficult to work a regular job. So they utilize their talents and enthusiasm the best they can to try to earn money. Or someone may promote an organization or facility which helps others, offering small items of artesania in return for small donations. Or a deaf person may distribute prayer cards with ASL symbols on the back, or even hard candies, asking for a small donation. So you can expect the unexpected. A word of warning, however, about riding the buses on certain days. If you are going into or around Chapala on a Monday, Ajijic on a Wednesday, Jocotepec on a Thursday, or Ixtlahuacan on a Sunday… Those are the days each area has its tianguis, or main open-air market. The buses will be crowded from 8 am until at least 3 pm. You may have to stand in the aisle, packed between other riders, instead of sitting down. But any other time, riding the buses is an economical and interesting way to get around. Tarra’s articles are well-known to Lakesiders. She has lived in Mexico for 22 years, many of them among the reclusive Huichol Indians, learning their indigenous culture. Her years here have given her a unique understanding and perspective of our Mexican hosts. In addition to being a writer, Tarra is a certified naturopath and nutritionist. She can be contacted at nutridoc@ymail.com.